Adenosine: “As long as the wide complex tachycardia is monomorphic and regular, adenosine is safe and guideline-approved for a stable patient, and assuming I am prepared for the ever-present chance of unexpected adenosine-induced rhythm deterioration just like I would in a narrow complex SVT conversion, then there cannot be any error attributed to considering FVT in this situation.” Dr. Smith would only give adenosine if RVOT is on the differential diagnosis, and that would be when there is LBBB pattern with inferior axis. Excellent, thought-provoking post by Drs. Meyers, Smith and Weingart on evaluation and treatment of idiopathic VT. The fact that 2 approaches to practice are proposed (ie, Option #1 = “Honey Badger” — vs — Option #2 = “Fancy Pants”) supports the clinical reality that there simply is no perfect answer. In the hope of offering additional perspective that for selected patients may fall in between the “Honey Badger” and “Fancy Pants” options — I’ll add the following thoughts. There are occasions when you can definitively distinguish between VT vs SVT with either aberrant conduction or preexisting BBB (Bundle Branch Block). These include recognition of definite AV dissociation with capture and/or fusion beats. CAVEAT: In my experience, the phenomenon of AV dissociation is often thought to be present, when it in fact is not. But if it is truly there — then the rhythm is VT (See ECG Blog #133). There are other occasions when you can with >95-98% certainty, tell that a rhythm is either VT or SVT. These very-high likelihood specificity situations are more common than is generally appreciated. Remember that one starts with ~80+% likelihood that a regular WCT ( = Wide-Complex Tachycardia) without clear sign of atrial activity is VT. This goes up to over 90% likelihood of being VT in older patients who have underlying ischemic or structural heart disease. Certain characteristics regarding QRS morphology and frontal plane axis may sometimes further enhance VT likelihood to ≥95% (See ECG Blog #42). Aberrant Conduction in a WCT rhythm arises because one or more conduction fascicles are refractory due to the rapid rate. As a result — QRS morphology during aberrant conduction generally manifests some form of conduction block (ie, RBBB, LBBB, LAHB, LPHB, RBBB/LAHB, or RBBB/LPHB). There are certain QRS morphologies that carry extremely high specificity for either aberrant conduction or a ventricular etiology. Thus, the finding of a completely typical RBBB pattern in lead V1 (ie, rsR’ with taller right-rabbit ear and S wave that descends below the baseline) — in association with a narrow upright R wave with wide terminal S waves in leads I and V6 — is virtually diagnostic of a supraventricular etiology. 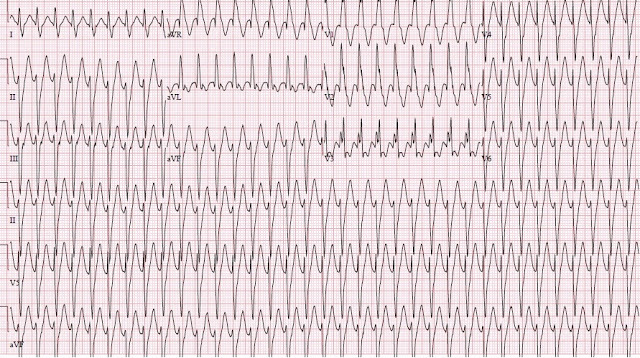 In contrast — QRS morphology that is not suggestive of any form of conduction block moves the needle up from the starting point of ~90% likelihood, that a WCT without atrial activity in an older patient with heart disease is VT. For example — the LBBB + Inferior Frontal Plane Axis Morphology shown in the above discussion (which I’ve reproduced in Figure-1) is highly unlikely to represent an SVT with LBBB because, despite the monophasic R wave in lead V6 — it manifests the following features which are extremely atypical for a supraventricular etiology with LBBB conduction: i) an all negative QRS in lead aVL; ii) a very wide initial positive deflection (r wave) in leads V1 and V2; and, iii) extremely early transition (with R>S already by lead V3), which is clearly not the pattern seen with LBBB conduction disorders, for which transition usually does not occur until after V4. CAVEAT: Anything is possible. Some patients (much more likely in those with severe underlying heart disease) may have very unusual QRS morphology on their baseline ECG, or may develop atypical morphologic aberrant forms. This is why >95% likelihood of VT based on morphologic characteristics is not the same as 100% likelihood. Figure-1: While using QRS morphologic characteristics is not 100% specific — several features in this example of LBBB-like conduction strongly suggest that the rhythm is VT and not supraventricular (See text). If in doubt as to the etiology of a regular WCT rhythm without clear sign of atrial activity — then assume VT until proven otherwise. Treat accordingly. Remember, one has to prove that a WCT is supraventricular, rather than the other way around. If the patient in question is at all hemodynamically unstable — then immediate electrical cardioversion is indicated regardless of the etiology of the rhythm. A surprising number of patients who present in a sustained regular WCT rhythm may be hemodynamically stable. In this situation, one could either: i) Use electricity ( = the “Honey Badger” approach); or, ii) Contemplate other options. Some patients with sustained VT may remain alert and hemodynamically stable for not only minutes, but for hours or longer. Therefore, an attempt at medical therapy is reasonable for such patients (with readiness to shock if at any time during the process the patient becomes unstable). If clinical and ECG parameters suggest the patient has ischemic VT (ie, older patient; presence of underlying coronary or structural heart disease) — then Adenosine is unlikely to work. This drug is probably best avoided in such cases. A significant minority of patients with VT have idiopathic VT (ie,VT that occurs in a patient without underlying heart disease). Specific prevalence figures for the relative percentage of ischemic vs idiopathic forms of VT will vary, depending on age and characteristics of the population studied. The “good news” (as per the above Table by Dr. Meyers that compares Classic vs Idiopathic VTs) — is that in addition to being younger (often <40yo) — there is less risk of hemodynamic deterioration during idiopathic forms of VT, and these patients clearly have a better long term prognosis. PEARL: Suspect that an idiopathic form of VT may be present when the patient is a younger adult without known coronary or structural heart disease — especially if this otherwise healthy and active individual develops the WCT during exercise or other strenuous effort. NOTE #1: As per Dr. Meyers above — there are some adenosine-sensitive forms of VT (most notably RVOT VT). However, ECG appearance may not reliably predict all forms of idiopathic VT that might respond to Adenosine (See ECG Blog #35). This is the rationale for considering empiric use of Adenosine when confronted with a patient in a regular WCT in which the clinician is uncertain if the rhythm is SVT (with either preexisting BBB or aberration) or idiopathic VT. If the rhythm turns out to be a reentry SVT — then Adenosine will most probably convert the rhythm. And, this drug may also occasionally work if the rhythm turns out to be idiopathic VT, with little risk of clinical deterioration from Adenosine administration. NOTE #2: Because there are some adenosine-responsive forms of VT that are not always predictable from their ECG appearance — conversion to sinus rhythm following Adenosine administration does not prove that the WCT was supraventricular! NOTE #3: Prior to general acceptance of Adenosine as a superb antiarrhythmic agent in this country — Verapamil was frequently used as a diagnostic/therapeutic trial when clinicians were confronted with a WCT of uncertain etiology. Unfortunately, a significant percentage of those patients who turned out to have ischemic VT immediately decompensated as a result of the vasodilating and negative inotropic effects of Verapamil. This is why Verapamil should not be used when there is reasonable possibility that a WCT is ischemic VT. On the other hand — Verapamil is the drug of choice for the idiopathic VT form known as Fascicular VT (See ECG Blog #38). When the ECG appearance and the clinical situation strongly suggest Fascicular VT (ie, younger adult patient; apparent absence of coronary or structural heart disease) — then empiric Verapamil is perfectly reasonable. The ECG should show a QRS complex that is not overly wide during the WCT (ideally ≤0.13-0.14 second) — with QRS morphology consistent with a RBBB/LAHB-like pattern (less often a RBBB/LPHB pattern). PEARL: The presence of somewhat atypical morphologic features for the conduction block during the WCT make it more likely that the rhythm is VT rather than SVT with aberrancy (See ECG Blog #85). That said, since you are avoiding Verapamil in patients likely to have ischemic VT (ie, older patients — those with suspected coronary or structural heart disease — and, with morphologic ECG features showing a wider QRS that does not resemble any form of conduction block) — use of Verapamil in those WCT patients who are thought to have either SVT or Fascicular VT is a win-win, since the drug is unlikely to harm in this situation, and it has a good chance to be effective for either arrhythmia. Our thanks to Drs. Meyers, Smith and Weingart for this insightful discussion! Thank you for another great post, but I have a question from a prehospital perspective. I'm a paramedic, and while I read your blog (and others like it) regularly, not many of my colleagues do. Our protocols call for the typical ACLS anti-arrhythmics (e.g. Amiodarone, Lidocaine) to be given for all stable monomorphic wide-complex tachycardias, not just typical VT. Would these drugs be effective on idiopathic VTs? Glad you're reading the blog! Good question. No, they are generally not effective. Great post Dr. Meyers! I think I noticed a small typo in the bottom line. On the topic of adenosine it is noted that "Dr. Smith would only give adenosine if RVOT is on the differential diagnosis, and that would be when there is RBBB pattern with inferior axis." 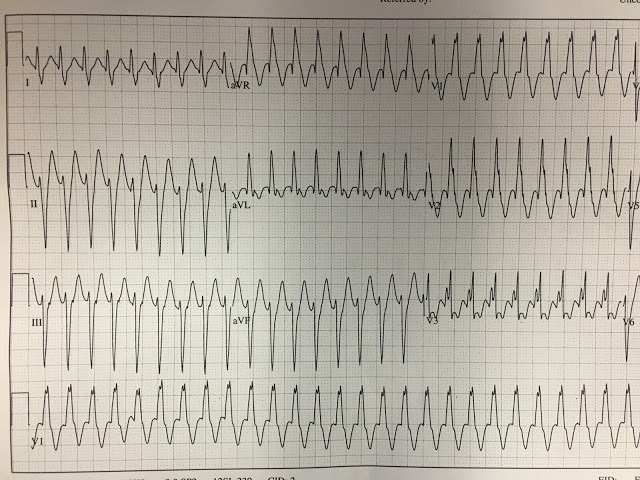 I believe it is meant to be read LBBB pattern with inferior axis. I wonder how EPs and cardiologists will help any better in diagnosing the exact etiology BEDSIDE or can they? Very detailed information.. I guess I need to be careful to call a WCT; FVT or RVOT henceforth. So to be on safer side I would (in a stable patient) try Adenosine and then consider cardioversion as patients do not like getting shocked when we discuss about treatment plans with them. One question, does Adenosine works only in RVOT? what about Amiodarone? Could you write more on the treatment strategies? Thank you. Adenosine supposedly works in RVOT, and usually works in SVT with aberrancy. Amiodarone is indicated for wide complex regular tachycardia according to our ACC/AHA guidelines as an option, assuming you do not think it's SVT. I would say in general that, if you do not suspect a particular SVT with aberrancy or a particular idiopathic VT on the differential, then just revert back to your classic strategy for wide complex regular tachycardia. For many people, this includes drugs like amiodarone or procainamide (if you can get it easily), all vs. elective cardioversion. Remember, these idiopathic VTs are really only a consideration in stable patients with wide complex regular tachycardia for whom you have some time to think. Don't forget that the context for this is your regular SVT vs. VT paradigm. Than you so much for this post! Amiodarone is not a bad choice in these cases. For classic VT amiodarone sometimes works, even if less often than procainamide. For SVT with aberrancy, amiodarone does have AV nodal blocking effects, so that may break and suppress the rhythm. For IVT, I do not know which particular rhythms would respond to amiodarone (I don't think anyone knows this), but I could imagine that sometimes it may work. Just as long as the rhythm is not irregular and polymorphic (like AF with WPW would be) then I don't see any clear downside to amiodarone, except that it might simply not work in many scenarios.